The CIRUS research reactor at Trombay went critical on 10 July 1960, making it the second oldest reactor in India. It is modeled on the Canadian Chalk River National Research X-perimental (NRX) reactor. The 40MWt reactor burns natural uranium fuel, while using heavy water (deuterium) as a moderator. The unsafeguarded reactor, which can be fueled online, is capable of producing about 9-10kg of weapons-grade plutonium annually. The reactor was built with Canadian assistance while the United States provided the initial supply of heavy water. India pledged to the United States to use the CIRUS reactor only for peaceful purposes. Likewise, a 1956 Indo-Canadian agreement prohibited the use of plutonium produced in the reactor for non-peaceful purposes. Despite these restrictions, the CIRUS reactor provided the plutonium for India's 1974 "peaceful nuclear explosions." Canada and the United States subsequently ended all nuclear cooperation with India, including Canadian fuel shipments. CIRUS was shutdown in September 1997 for refurbishment and is scheduled to resume operation in 2003. "The National Research Universal Reactor," CBC Archives, January 2005, http://archives.cbc.ca. Andrew Koch, "Selected Indian Nuclear Facilities" Center for Nonproliferation Studies (CNS), 1999, www.nonproliferation.org. 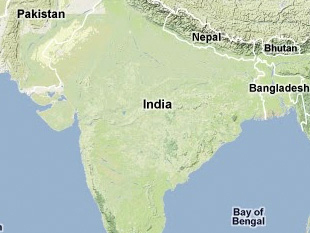 David Albright and Mark Hibbs, "India's Silent Bomb," Bulletin of Atomic Scientists, September 1992, www.thebulleton.org. George Perkovich, India's Nuclear Bomb: The impact on Global Proliferation (Berkley, CA: University of California Press, 1999), pp. 27-28, 398. Leonard Spector and Jacqueline Smith, Nuclear Ambitions: The spread of nuclear weapons 1989-1990 (Boulder, Colorado: Westview Press, 1990), pp. 71, 78, 308. 2000 World Nuclear Industry Handbook (Wilmington, UK: Nuclear Engineering International, 2000), pp. 198.